These chimney brush rods screw together to extend up into the chimney for cleaning. 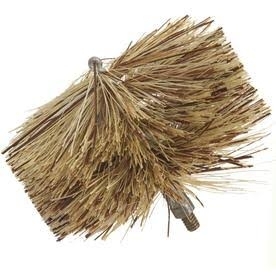 For use with chimney brushes (not included). Just screw chimney brush onto rod and add as many extension rods as you need to clean your whole chimney. Rod is flexible yet stiff. Negotiates chimneys with 30 degree or less elbows or bends. Chimneys are safer and more efficient when they are clean. 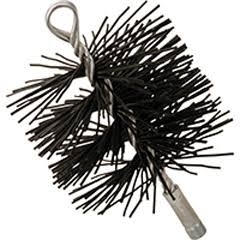 These sturdy, steel wire chimney cleaning brushes get to work fast on soot and creosote, making it easier and more efficient to accomplish cleaning your stovepipe. Keep your chimney clean and safe with regular and proper maintenance. 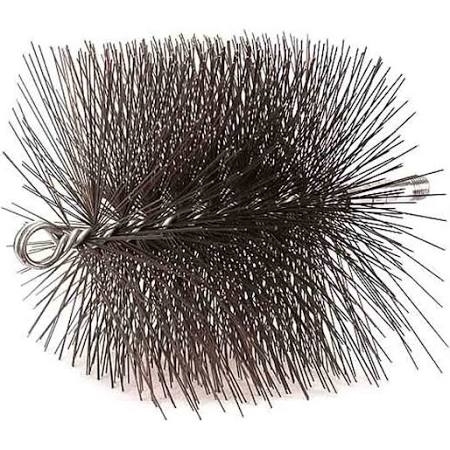 Premium quality brush made with hundreds of stiff, round wire bristles. Can be used in stainless steel and clay chimneys. Stoves work more efficiently when your stovepipe is clean. Keep your stovepipe safe and in optimum condition by cleaning soot and creosote away regularly. Made with hundreds of stiff wire bristles. Can be used in stainless steel and clay chimneys. 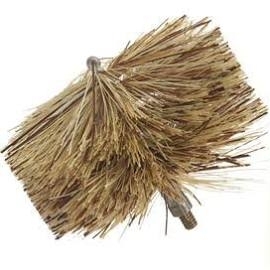 This sturdy wire brush scrubs away soot and creosote to help your stove burn safer and more efficiently. Regular and proper maintenance of your stove is essential and this brush does the trick. If you burn wood in a stove or fireplace, you know how important good chimney maintenance is. Our chimney brushes help you keep your chimney clean and clear of creosote, thus drastically reducing the chance of chimney fires in your home. 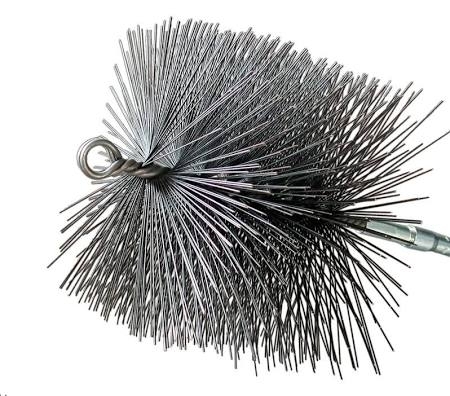 Wire bristles fit snugly in chimney or flue liner for efficient cleaning. Don't forget the extension rod, sold separately. If you burn wood in a stove or fireplace, you know how important good chimney maintenance is. Our chimney brushes help you keep your chimney clean and clear of creosote, thus drastically reducing the chance of chimney fires in your home. 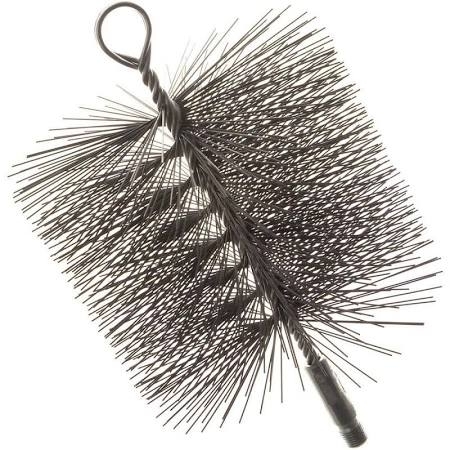 Wire bristles fit snugly in chimney or flue liner for efficient cleaning. Attach to our fiberglass brush rod (sold separately). This compact, low profile brush is designed to clean both pellet stove and dryer vents. The benefits of this design are: Ability to follow chimney and flue contours, easily reverse direction in the flue for easier cleaning, and easily negotiate angles and bends commonly found in flues. Results in a more thorough cleaning with less effort. Attach to vent cleaning hose (sold separately). Made with tough, durable, black polypropylene bristles. Designed for removing soot from coal, oil, and gas stoves. 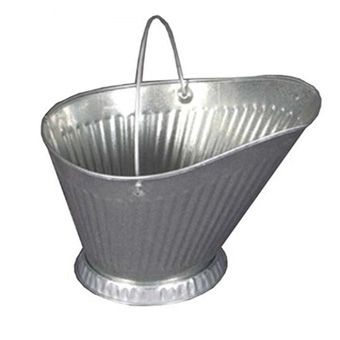 Can be used in stainless steel chimneys. 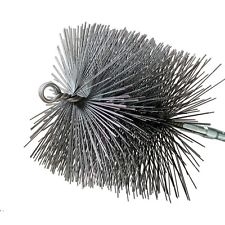 Durable fiber brush designed for cleaning pellet stove vent pipe. For use with a pellet brush rod (sold Separately). Improves heat efficiency and reduces fire hazard. Works great on dryer vent pipe too! 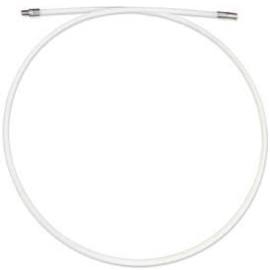 Rod is made of flexible, white nylon with male and female ends. 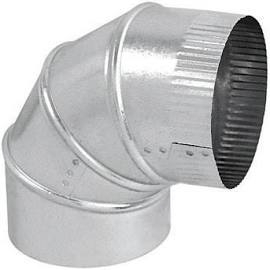 Designed to negotiate 90 degree joints in most pellet stove flues and vents. 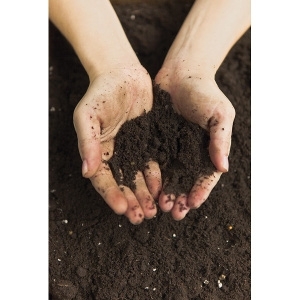 Removes hard ash and deposits build-up. Can be cleaned without disassembly. 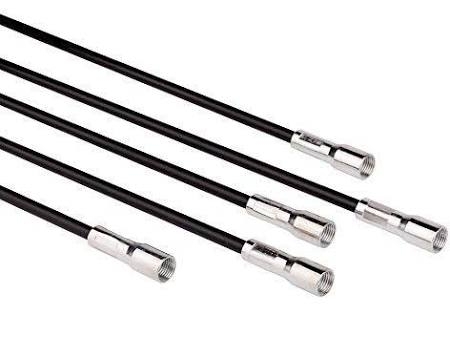 This rod's quality construction utilizes an open single spiral design, with plated shafts and threading on the end for easy coupling with fiberglass rods or pull rings. Regular maintenance of flues and stovepipes helps your stove to burn more efficiently and be safer to operate. It is recommended that you clean your chimney every few weeks. This sturdy, spring wire brush is designed with the homeowner in mind. 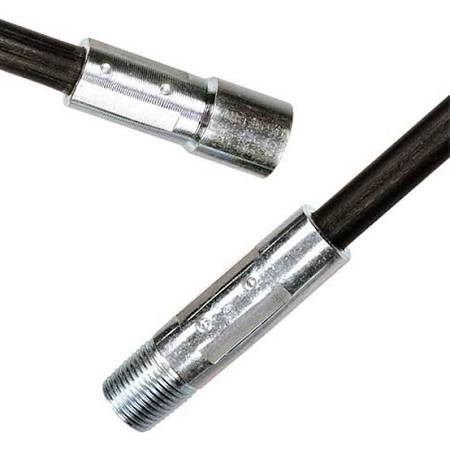 It has an open, single spiral construction, plated shafts, and threading for easy coupling with fiberglass rods or pull rings (sold separately). Scrubbing your flue and stovepipe regularly with the wire chimney cleaning brush helps your stove to burn more efficiently and safely. This 5 pc. fiberglass chimney rod kit is the perfect tool for hard-to-reach areas of the chimney. Every rod is 4 ft. long, rods connect, measuring 18 ft. in total. Make your next chimney cleaning a snap and help your stove burn more efficiently and safely. 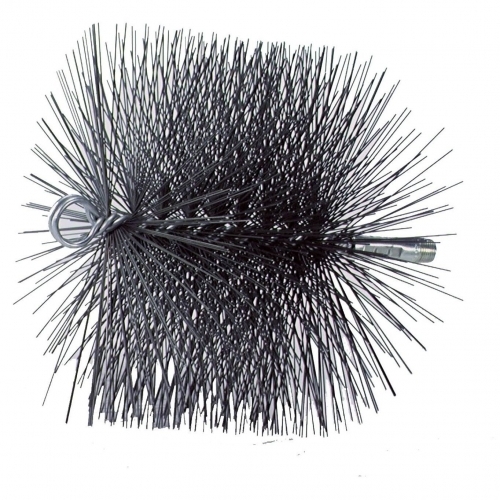 Premium quality brush made with hundreds of stiff round wire bristles. Can be used in stainless steel and clay chimneys. Scrub your chimney regularly with a chimney cleaning brush to help your stove burn more efficiently and safely. It is recommended that you clean your chimney every few weeks. Covers excess area around flue opening and provides a finished appearance where the flue pipe connects to the masonry chimney breech. Manufactured from 24 gauge, black matte, pre-painted scratch and chip-resistant steel. 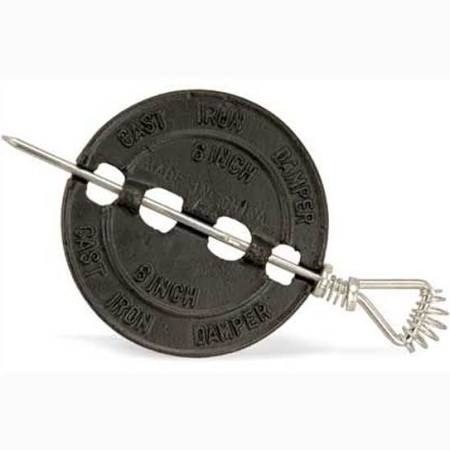 Use with wood or coal stove to regulate air by twisting handle to open and close damper. Install in flue pipe. Improves stove efficiency. Size: 6 Material: Cast iron. 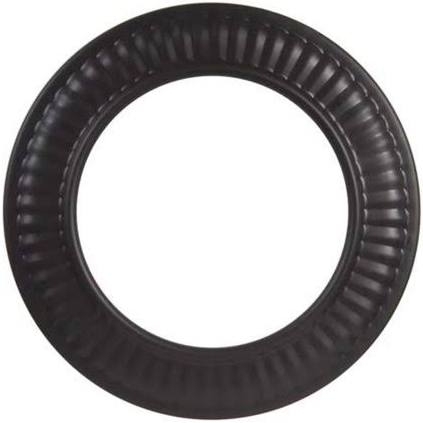 Also available: 3" damper #104104, 4" damper #104103, 5" damper #104101, 7" damper #104100, 8" damper #104099. Pull Ring allows you to attach your brush to a rope. Can be pulled through your chimney for cleaning. 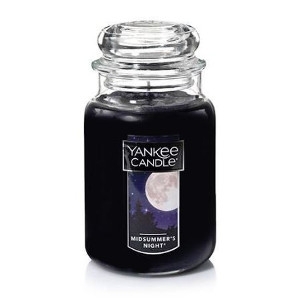 Use with rear outlet stoves. Used to direct the exhaust upward. Features an exclusive harder, more scratch-resistant paint. Pipe smokes less at start-up due to higher-temperature-rated paint finish. Application: Single wall black pipe. 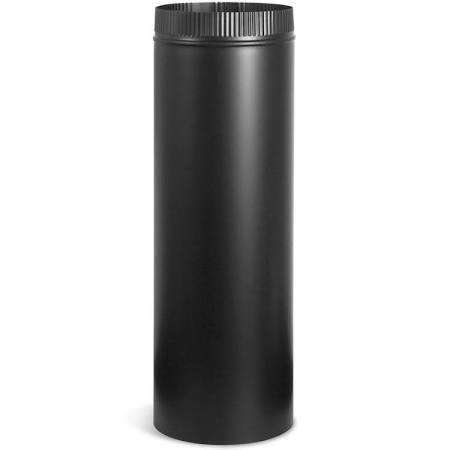 Also available: 7" black stove pipe tee #104149, 8" black stove pipe tee #104148. 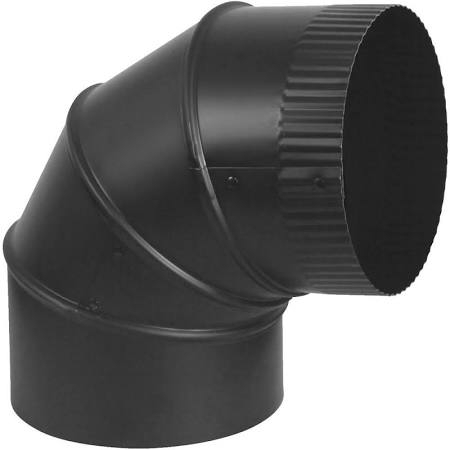 This 4 inch pre-painted black stove pipe elbow is used to connect two lengths of flue pipe together. 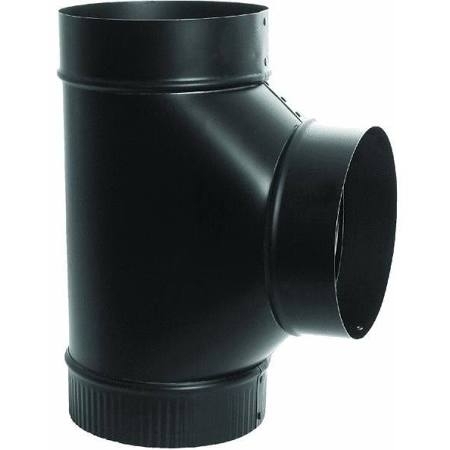 Also available: 5" black stove pipe elbow #104167, 6" black stove pipe elbow #109323, 7" black stove pipe elbow #104170, 8" black stove pipe elbow #104171. Use when installing or replacing a water heater, for residential and commercial use with heating and air conditioning ductwork, furnace piping and venting, and exhaust fans. Also available: 4" elbow #104177, 5" elbow #104178, 6" elbow #108512, 7" elbow #104180, 8" elbow #104181. 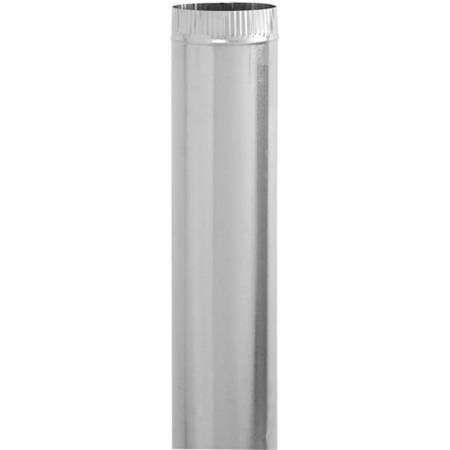 Rigid duct is perfect for a variety of venting and air handling applications. The smooth walled duct is easy to clean and provides better air flow and reduced lint build-up when used for dryer venting. Simply roll the duct and connect the snap lock tongue and groove seam to form a secure joint prior to installing. Also available: 6" pipe #104241, 7" pipe #104242, 8" pipe #104243. Used to connect woodstove to entrance of chimney.